Our second film highlighting the power of music, brings to life a time when government restrictions made it difficult for people to enjoy the music they loved. “Radio City” is the story of a group of English renegades who, in 1964, used dogged creativity to provide an alternative to the government controlled BBC Radio and bring the music that people wanted to hear to the airwaves. To get around the restrictions, these pirate radio broadcasters situated their station in an abandoned World War II gun tower eight miles off the UK coast – technically in International waters. With unflagging ingenuity, they retrofitted the tower with a transmitter from a WW II bomber, used car batteries for power and a scaffold pole as an antenna. Because they were in International waters, they could play whatever music they wanted to. Take a minute to watch our second film, and tell us in the comments what the power of music has motivated you to do. 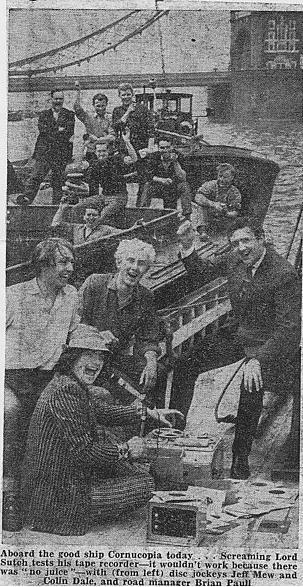 The men of Radio City sailing the Thames in 1964. Foreground: David Edward Sutch, 2nd row (left to right) Geoff Mew, Colin Dale, Brian Paull. We agree and we provide a musical tool that helps people learn songs more quickly and easier. The basic idea is that if you can slow a song or solo down, you can more easily hear and understand what is being played, and then more easily follow along and learn it.